Yves Lefèvre was born in 1962 in Suresnes (France). He started diving in 1975 in swimming pools in Paris. Monitor of first-aid to the civil Protection until 1985, he was also monitor of subaquatic diving since 1982 and diver class 2. He left for the French Polynesia in 1985 and created the first diving center of the Tuamotu islands in Rangiroa, the Manta Ray Club. He then opened in 1992 the second Manta Ray Club on the atoll of Tikehau, and organize since 1996 diving with Humpback Whales in Rurutu, in the archipelago of the Austral Islands. He guided the Calypso in the Tuamotus in 1987 for the commander Jacques-Yves Cousteau and worked on a certain number of film productions like Atlantis with Luc Besson, Ushuaia with Nicolas Hulot and Coral Reef Adventures with Michelle and Howard Hall. 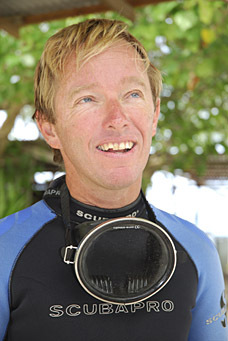 He co-wrote several submarine documentaries: The Lagoon of the Manta Ray in 1997, The Whales Dance in 1998, Sandra and the unknown Shark in 2002, Sharks under high surveillance in 2006, and published also, alone or with other authors, three illustrated works: Rangiroa under the sign of fish, Small Whale and the Guide of the fish of Tahiti and its islands. Photographer of the Biosphoto agency and submarine cameraman since several years, he collaborates with Christian Pétron to the productions of Cinémarine and he is member of the team of Jean-Michel Cousteau, Ocean Future Society. Yves Lefèvre otherwise develops a program of ecotourism in Colombia, in the tropical fauna and flora sanctuary of the island of Malpelo as well as in the Orinoco and the Colombian Amazon. Melon Butterflyfish Rangiroa French Polynesia ; Page 175.